These days, very few people rebuild engines at home. In fact, of the last few hundred feature cars that we’ve covered in AutoSpeed, off-hand I can’t think of one which had an owner-built engine. So when we talk about using measuring tools in car modification, there’s not a lot of point in covering dial indicators and internal and external micrometers – almost no-one DIY modifying their car uses them. However, there’s still a multitude of important uses for measuring tools. From as simple a task as making a bracket (but bracket making is actually seldom simple!) through to mounting an amplifier, drilling holes, measuring coil spring wire thickness, moving the battery from under the bonnet to the boot – to do a good job, all will require the use of measuring tools. So what are they and how do you use them? 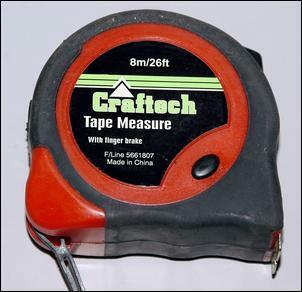 For non-precise, relatively long measurements, use a tape measure. Retractable metal designs give fine accuracy (don’t use cloth tape measures!) and are available very cheaply. 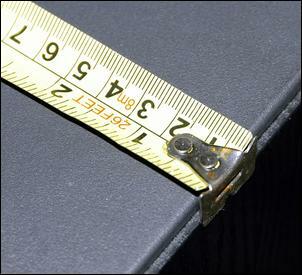 ...but when the tape is hooked over an edge, it measures from the inside of the edge. In this way the moveable end tip cancels out its own thickness. The next level up of accuracy in general purpose measuring instruments is provided by a steel rule. Again, it’s a very cheap instrument. 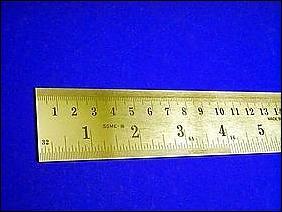 A typical steel rule is 300mm long with markings each single millimetre. However, better quality rules have markings over the first 10 or 20mm that are in half-millimetres. There are two important aspects to keep in mind when using a steel rule. The first is that the rule should be placed so that the graduations are as close to the work as possible. For example, where possible, the rule should be placed at 90 degrees to the work so that the graduations actually touch the work surface. Secondly, a habit to avoid is measuring a work piece from the beginning of the rule – the very end markings of a steel rule may have been damaged (this occurs much more easily than to markings along the inner length of the rule) and it’s also much easier to accurately line up two markings, rather than one marking and the end of the rule. However, when you use the rule in this way, remember to subtract the initial numbered amount from the total reading. 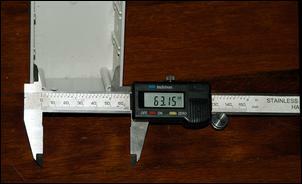 A steel rule can also be used to assess the flatness of a surface. 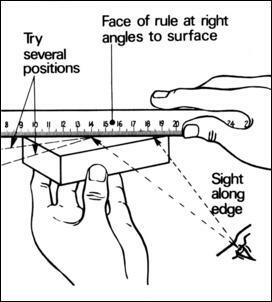 Place the rule on edge across the surface then hold the work and the rule up to the light. If the surface is flat, no light will be able to penetrate between the edge of the rule and the work piece. In any typical home workshop, steel rules wear out – normally because of inadvertent abuse like being trodden on, cut with power tools and so on. Expect to replace a steel rule every few years. 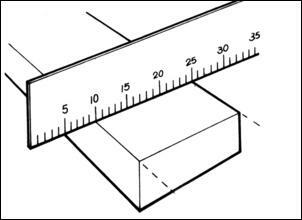 One metre long steel rules are also extremely useful – as a marking edge, to check for flatness and of course, to measure lengths. However, long steel rules tend to be much more expensive than short ‘uns. Digital calipers are nearly as useful as the humble tape measure and steel rule. They are also now so cheap that no do-it-yourselfer should be without one. Digital calipers are most commonly available in 150 and 200mm measuring sizes. Both sizes are useful – the smaller calipers will fit into tighter spaces and the larger ones will – duh! – measure larger work-pieces. Calipers are fitted with surfaces to make external, internal and depth measurements. The external ones fit across the work (eg to measure the diameter of a rod), the internal ones measure the width of openings (eg of a cut-out being made in a panel to mount a head-unit) and the depth provision can be used to measure the length of a drilled hole. 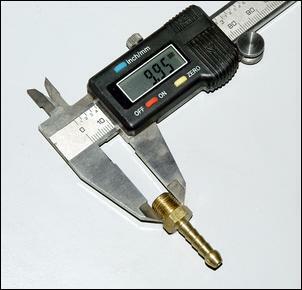 The primary use of a digital caliper is the measurement of the thickness of an item. This measurement requires the use of the external calipers. The instrument is fully closed, zero’d, then the external calipers placed so that they are a just-snug fit on the item. The reading is then made before the calipers are removed. Used in this way, digital calipers are especially useful in measuring screws and bolts to make accurate sizing of the drill-bit easy, measuring coil spring wire thickness (something that it’s important to do very accurately when comparing spring rates) and measuring sheet metal gauge. And literally hundreds of other uses! Internal measurements with digital calipers should be made only when the opening has parallel sides. 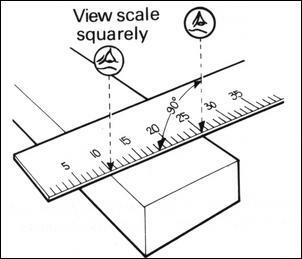 If you try to use the internal measuring calipers to measure the diameter of a hole, the thickness of the internal measuring jaws will give an incorrect reading. 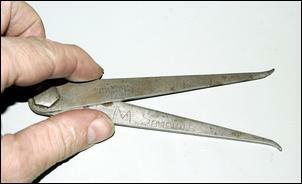 Instead, in this situation you need to use thinner manual calipers, as described below. With the low price of stainless steel digital calipers, it’s not worth buying plastic imitations. Arguably, it’s also not worth hanging on to old-style vernier calipers – the digital readout is much quicker and easier to read, with less likelihood of mistakes being made. There are many situations where a digital caliper cannot be conveniently used – perhaps because the jaws are not long enough to reach the work-piece. In this situation, manual calipers perform well. The calipers are opened (either by being pulled open against a friction screw or having an adjustment knob unwound) until the jaws of the caliper are a gentle push-fit over the work. The calipers are then transferred to either the digital calipers or steel rule and a reading made of the distance between the manual caliper’s jaws. With care, this process can be highly accurate.